DRIVERS OF QUADS and scramblers are being warned to stay off the roads after two recent incidents. One was a head-on collision with a jeep. In a statement South Dublin County Council said the driver of the quad was lucky to escape life changing injuries. The council is warning people about the dangers of using scramblers and quads as some people may have received the vehicles as gifts over the Christmas period. Parents and users are being urged to be aware of the risks and dangers associated with riding these vehicles and also to wear the appropriate safety gear. Declan Keogh, Road Safety Officer, South Dublin County Council said, “What many people don’t realise is the potential danger or risks which riders are faced with while using scramblers and quads. They are in fact vehicles which are designed for off-road use and should be used in a controlled environment but not only that, an operator of a quad or scrambler is also required to follow the same rules of the road as other vehicle users. 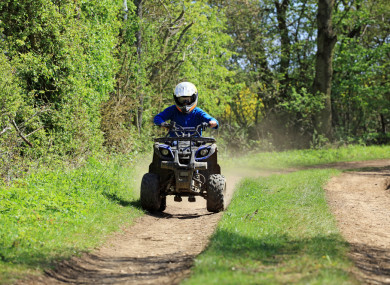 The Road Safety Officer has begun an advertising awareness campaign to highlight the dangers of using these vehicles and to appeal to parents and riders themselves to use their quads or scramblers with safety in mind. The awareness campaign will involve advertising in cinemas, on social media, in local press, shopping centres and community centres. Email “Quads and scramblers warned to stay off roads after two crashes”. Feedback on “Quads and scramblers warned to stay off roads after two crashes”.